Today, I went to Moda Espresso and Wine Bar, a coffee shop in Chelsea, opened in 2011, and located few steps from FIT (hence the name Moda). It was not to try some of their Italian dishes (they serve panini, salads, wrap, pizza and...Italian sushi made with prosciutto and mozzarella!). No, it was to celebrate the 50th anniversary of Nutella, the delicious chocolate and hazelnut spread. Well, knowing my love for Nutella, there was no way I could not go! But the most surprising was the Nutella espresso that I could not stop drinking, as it married two components I am addicted to: Nutella and espresso. I stirred it to ensure the Nutella was mixed with the espresso, giving a nice sweetness and flavor (interestingly, I usually hate flavored coffee, but not this one). And for sure, I did not miss any bit of it, using the spoon to get the Nutella that was in the bottom. I spoke briefly with one of the owners, Renato Besabe, and he told me that the idea to serve Nutella espresso came from his business partner, Giuseppe Scotto. Giuseppe is from a small seaside province outside of Naples and, apparently, people in South of Italy drink their espresso with a touch of Nutella. This was a great event at Moda Espresso and Wine Bar and a great celebration of Nutella 50th Anniversary. 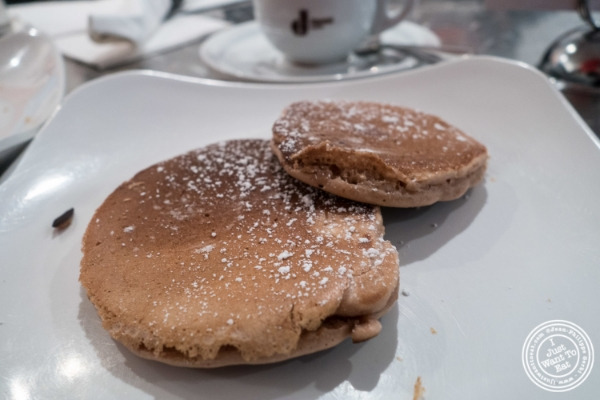 Whether you are looking for a good coffee (with Nutella or not) or a bite to eat with a nice glass of wine, Moda is a great place to go to. And do not ask me if I would go back! Of course I will!